With all the chilly weather we’ve been having in San Francisco and a few pretty rainy days, I’ve been crazy excited to finally pull out my Hunter rain boots to pair with some of my favorite cozy weather sweaters. My favorite sweater lately has been this ski scene sweater from J.Crew Factory. Besides being super warm and cozy, the overall ski mountain scene that covers the front and back is beyond cute. It makes me feel like I should be hitting the slopes instead of heading to work in the morning. The sweater pairs well with a ton of my favorite cold weather looks, including this rainy day look that worked so well as we went to pick up our Christmas tree. I paired it with the ultimate in rainy day wellies, my Hunter ‘packable’ red boots and Hunter fleece wellie socks. 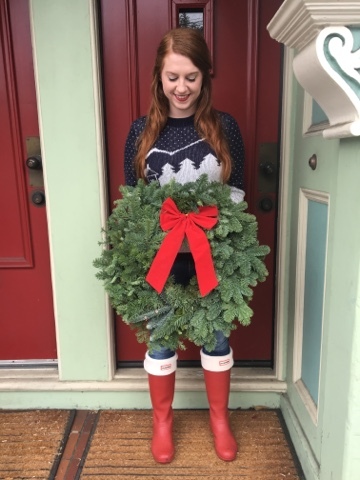 Along with picking up the perfect Christmas tree, I was excited to also pick up a Christmas wreath to hang on our red door for the holidays! It came with a big red velvet ribbon and was only $7! Home Depot, you rock. This jumper (as we in the UK call it!) is super cute! I love the pattern and the ski theme is just adorable. I love the way you've styled it too! Gorgeous wreath! 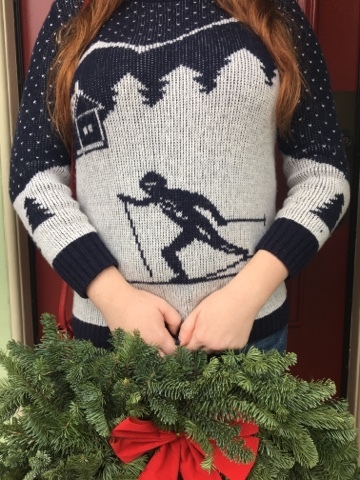 Adorable sweater and yes perfect for the slopes…sad to say I have not done much skiing in my lifetime, would like to learn! That sweater is on my wishlist — it's so cute. Love your sweater and your wreath! Very cute. I like that it's a bit understated (compared to other Holiday Sweaters).